In what was expected to be an offensive shootout, this game turned out to be all about defense. Two of the top scoring teams in the league last year were held to just 14 and 9 points, something I’m sure no one really expected. The Saints started the game as usual, marching right down the field with Brees picking up where he left off. He went 12 of 15 for 138 yards and a touchdown in the first quarter! But the offense sort of sputtered after that. After going a couple of three-and-outs to start their season, the Vikings offense didn’t really start getting its act together until the second quarter. That’s when they put together a successful 16 play drive for 66 yards that ended with a Ryan Longwell field goal. They were able to control the clock, methodically taking 9:28 off before having to settle for the three points. Nonetheless, I thought both defenses played well. But I don’t think anyone anticipated just how well the Saints defense was going to perform. Brett Favre finished the game with 171 yards, 1 touchdown to TE Visanthe Shiancoe, and 1 interception by Saints LB Jonathan Vilma. But even more shocking was the fact that Adrian Peterson had 19 rushes for only 87 yards, particularly the way he started off running all over the field. Shiancoe had 4 receptions for 76 yards and a touchdown. Both teams recorded a sack and Remi Ayoedele blocked a PAT for the Saints special teams. Overall though, the Saints offense did well. Even though they didn’t run up the scoreboard the way we’re accustomed to seeing them do, they still managed to mount enough offense to salt this one away. After all, they were going up against a very good Minnesota defense. And they weathered it well. Brees was on-target from the start, completing 27 of 36 passes for 237 yards and 1 touchdown to Devery Henderson. He finished the night with a very impressive quarterback rating of 101.3 and an equally impressive 70.5 completion rating. Pierre Thomas got into a groove as well, finishing with 19 carries for 71 yards and a touchdown. Marques Colston had 5 catches for 62 yards. I think what we saw tonight is a totally different style of defense than the blitz-happy crew of last year. With Sedrick Ellis, (who recorded the Saints’ lone sack), back healthy, that allows the Saints to defend the run a whole lot better. It also allows them to pull back in coverage more to defend against giving up so many big plays. Overall, they did a very good job; holding Peterson to under 100 yards was no small feat. As expected, Jabari Greer and Tracy Porter played exceptionally well and I thought Malcolm Jenkins played well also. The biggest concerns for the Saints going forward from here are the two missed field goals by Garrett Hartley and the dropped passes. 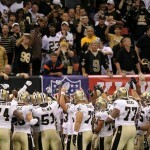 Even though both teams suffered from missed opportunities, the ones by the Saints proved to be more costly. Besides Hartley’s woes, a touchdown was dropped in the endzone by Robert Meachem and a first-down throw was mishandled by Henderson. As Saints fans, we have to be satisfied with the win. But there is definitely room for improvement and some areas that have to be cleaned up. It’s always more impressive when a win comes against a very good team like the Vikings. With this one in the books, the Saints can now look forward to the San Francisco 49ers next week. That one won’t be any easier than this one was, but if the Saints play as well as they did tonight and the result is the same, I’d say that one is going to be another thriller. Just a little note: the Saints only had 3 penalties for 20 yards. That is encouraging in itself. Great summary. 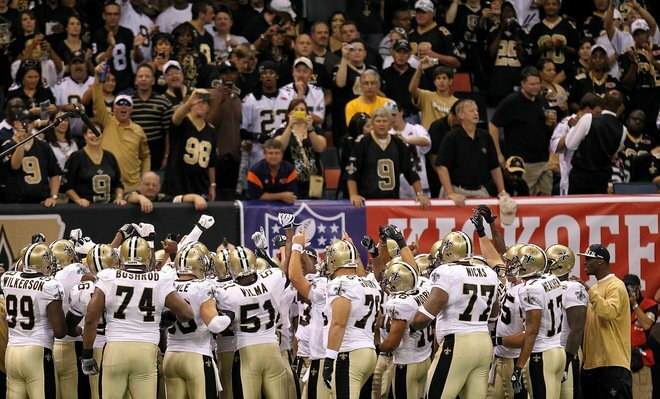 Saints all the way! Glad they stomped all over the Vikings, I hate them!